My goal was to make it large enough to decorate, but not so large that it got boring to make. 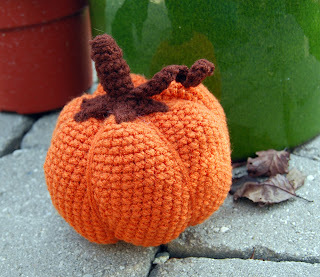 the pumpkin fits into my hand nicely, with no room for anything else. I stuffed it with a combination of fiber fill and cut up t-shirt from my rag bin so that it has a nice weight. This ami definitely falls into the "launchable" category. I'm not totally happy with the stem and little wispy bit of vine, but there is still time to work that out. perhaps, it's because the stem is just a little too long or maybe it's just the shaping. What do you think? Speaking of "what do you think," this is your chance to get your input on the pattern before I release it for the crochet-along. 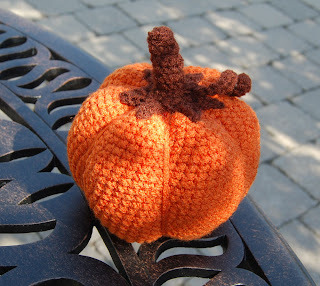 Remember that the goal is for me to provide you with a basic pumpkin that you can then decorate to show your own style. So, tell me what you think about this design! VERY cute! I agree, maybe just make the stem a little shorter? I think the shape is just fine. I found your blog too late for the owl CAL, so I'm excited that you're doing another one! I love it! I really like how simple it looks. The problem I had with the owl crochet along, (which I still plan on finishing!! ), was that I had a bunch of other projects going on at the same time. With this one it wouldn't take as long and I can see doing this in many colors and making a cute pumpkin patch! I agree with the other commenters though, maybe making the stem a couple rows shorter? Thanks for putting together another one! I will be sure to better follow along this time around! Oh my gosh that is the cutest pumpkin! I think it's a great size, but I do agree. The stem seems a bit chunky. I agree w/ SalemMomma...perhaps just a bit shorter would fix it. I really like it.I made some yrs ago. I assume it is done in a long strip then sewn end to end,then gathered up? so people could make different sizes by changing the amount of starting chain?If so would be nice to note,so they could make stacking pumpkins..just a thought.. I like it.the stem is ok,but if ya make it shorter it would look more stubby.keep up the good work. Has great shape. I'm excited to CAL again! hi i also agree with all other comments about making the stem slightly shorter. i would love to join your CAL it sounds like fun. 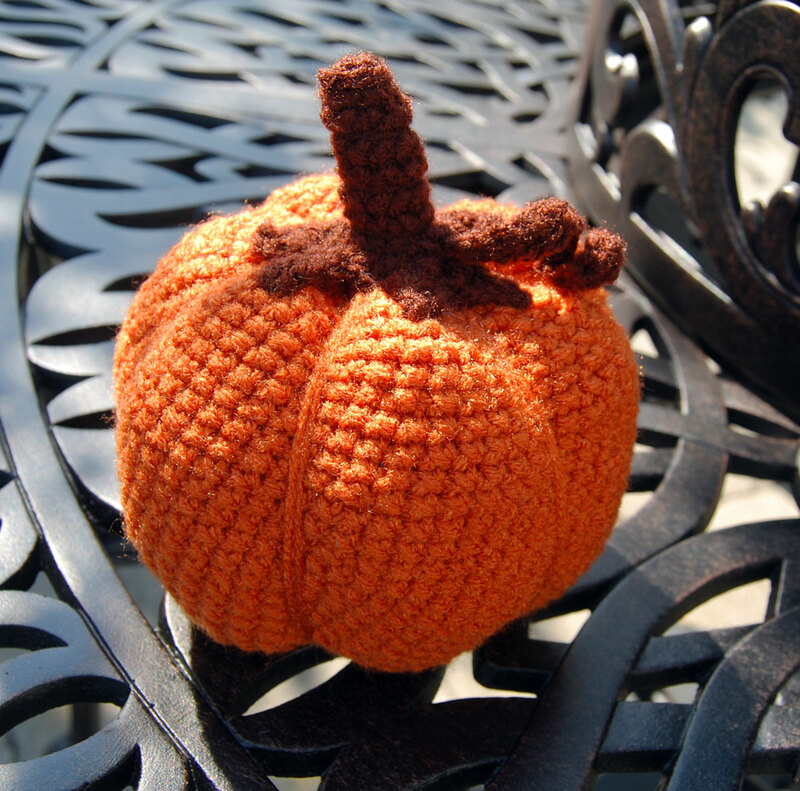 I am getting seriously addicted to blogging and crochet. Your pumpkin is really lovely and so reminds me of Autumn. I agree with the others just remove two rows love it being curly!!! All rightie -- so it looks like the majority vote is to remove a couple rows from the stem! I started a second prototype yesterday and hopefully will get some time to finish it this weekend... then it's on to pattern-writing! Hello!!! I love your blog and have given you a Blog with Substance award!!! !